Ser. # tag and Allen Electric & Equipment tag. Workhorse Pickup Winder at Gibson Kalamazoo since 1950! After the unboxing I contacted Geo. Stevens, who is still in business, to see if original sales records existed that could nail down the date of the machine. Several pre-auction descriptions of the Stevens winder conflicted as to when the machine was made. 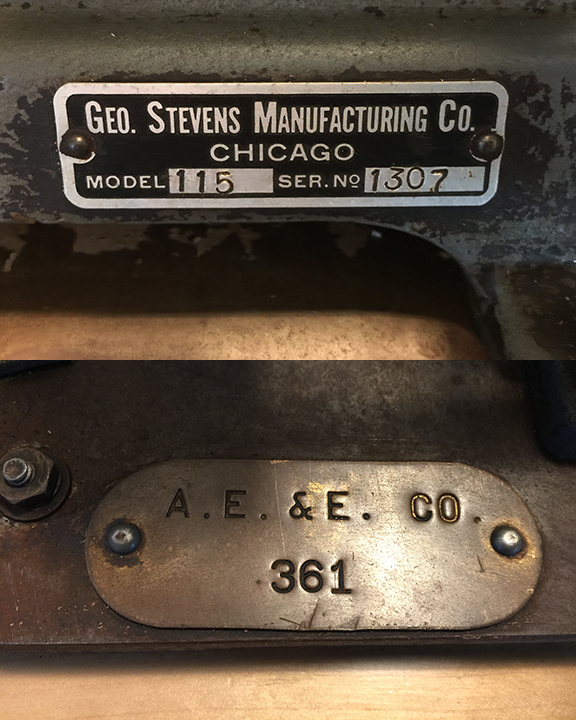 After an exhaustive search, Geo Stevens was able to locate the original sales record showing the machine made its way to Gibson in February of 1950 via Allen Electric & Equipment of Kalamazoo. The replacement Delco motor dates from 1956 indicating this machine saw a lot of use winding pickups in the Gibson Kalamazoo plant. Original fixtures give a unique winding action. The original pickup bobbin fixtures and couplings came with the machine and have a unique action as you will see in this slow motion video. I was a little concerned with the movement so I had a machine shop check it out and they said the wear to the couplings and fixtures is minimal and the machine always ran this way. I think Gibson surely saw this as a practical machine to get the job done but the practicality of these fixtures translates to a unique winding pattern. The fixtures themselves have a lip that limits the travel making it impossible for the wire to overshoot the bobbin. The traverse gears take into account the limit built in by the fixture. IMHO this is more evidence why these vintage machines do matter to the pickup repro maker. We are thrilled to add this machine to the other vintage winders in use every day here at ThroBak!